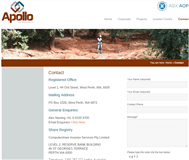 Apollo is an Australian Stock Exchange listed gold exploration company based in Perth, Western Australia and operating in Australia and West Africa. It is managed by an experienced board of directors with a background in success in the discovery of mineral deposits and creating company value. It has technical guidance in Africa though experienced staff geologists and consultants based in Abidjan, Côte d’Ivoire. Through its 100% owned operating subsidiary Aspire Minerals Pty Ltd, and its Ivorian subsidiaries, Apollo holds three granted exploration permits in northern and central Côte d’Ivoire. The exploration package includes over 1,000 square kilometres of prospective Birimian greenstone belts in one of the least explored terrains of the West African goldfields. 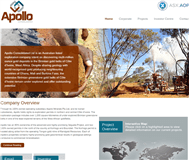 Apollo is systematically exploring the three properties for gold using geochemical exploration techniques developed in Australia, where the geology and regolith conditions are very similar. The Company is actively assessing other opportunities in the country, where it sees great opportunity to deliver rapid and cost-effective exploration success. Its current projects lie on greenstone belts that host million ounce gold deposits along strike, and show local evidence of structural complexity and host-rock alteration. Despite strong prospectivity, widespread gold anomalism in soils and mapped alteration the projects have had limited previous exploration and no drilling activity. 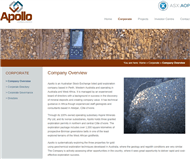 Apollo is focused on delivering exploration success through low-cost geophysical and geochemical-based target definition, and exploration drilling. 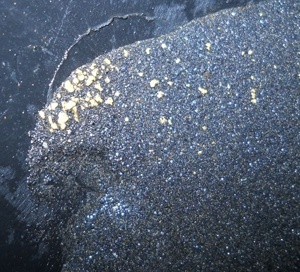 In excess of ten thousand geochemical samples have been submitted to laboratories for analysis with initial results generating several strong and previously unrecognized gold anomalies. Sampling will continue on both first-pass and infill grids ahead of mapping, trench sampling and targeted drilling. It is well recognised that Côte d'Ivoire has the largest allocation (35%) of Birimian age greenstone rocks of all the countries in the strongly endowed West African region; yet thus far has only contributed 4% of the combined >170Moz gold endowment (refer to Table). This ratio is best interpreted to indicate the country is relatively under-explored and has a high probability of delivering new and substantial gold deposits as exploration progresses into terrain that has seen little previous exploration work. Seguela is located on the southern extent of the Syama-Sissingue volcano-sedimentary belt in central west Côte d’Ivoire, near the town of Seguela. The regional belt hosts a number of significant gold occurrences in northern Côte d’Ivoire and southern Mali, including the multi-million ounce Syama gold mine. The 350 square kilometre permit covers a 35km strike of a north-south trending greenstone belt with known gold mineralisation. 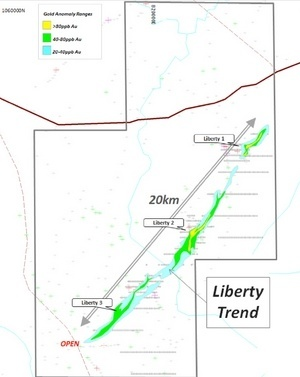 Previous exploration work by Randgold Resources Limited in the central portion of the permit defined an area of continuous >50ppb gold anomalism over 6.3km in strike and up to 1.4km in width (FIGURE). The anomaly encompasses broad zones of >200ppb gold soil anomalism coincident with a major shear corridor that extends the length of the project and shallow artisanal workings for alluvial gold. Within the anomalous area Randgold trench sampling has confirmed bedrock gold mineralisation in predominantly felsic intrusive host rocks at the Gabbro, Porphyry and Agouti prospects within the Seguela permit. 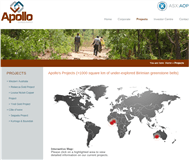 Apollo holds 100% of the Korhogo and Boundiali permits which were granted by the Ivoirian government late in 2014. Combined the permits cover over 750km2 of prime gold exploration ground at the intersection of two proven gold belts. The Korhogo permit is located 40km along strike from Randgold Resources’ 4.3Moz Tongon project, and 80km from Gryphon Minerals’ 3.2Moz Banfora project. The permit sits on a major structural corridor and covers compelling aeromagnetic targets. Boundiali is located on the eastern margin of the productive Syama belt (Syama goldmine >5.8Moz), some 50km south of Perseus Mining’s 1m oz Sissingue deposit. The confluence of two proven belts and operating mines along strike point to exceptional greenfield prospectivity. The permits lie in flat lying laterite terrain and are easily accessed by vehicle. The main service towns of Korhogo and Boundiali lies lie close to the permits and there are multiple domestic flights per week back between Korhogo and Abidjan. There is sealed road access from Korhogo to Abidjan, a distance of 549km. There is little documented past exploration in the project area. Previous workers had collected 1km x 1km spaced LAG geochemical samples, identifying a corridor of >50ppb Au anomalism coincident with the Tongon-Banfora structural trend. Individual LAG results grade up to 1,080ppb Au. The company has since validated a number of anomalous LAG points by completing local grids of soil samples. This reconnaissance-style soil sampling has confirmed significant gold anomalism in three locations on the Korhogo permit (‘Korhogo 1-3’) and one strong anomaly at Boundiali (‘Boundiali 1’). All anomalies are open to the limit of sampling. The Company holds 100% of the Rebecca Gold Project located in the southern Laverton Tectonic Zone (LTZ), 150km east of Kalgoorlie, WA. The LTZ is a regional scale shear/fault system that has proved to be one of the more productive gold trends in the West Australian Goldfields. The northern portion of the LTZ hosts the Sunrise-Cleo, Wallaby, Lancefield and Granny Smith gold camps, that have a combined gold endowment of well over 20Moz. The company holds in excess of 250 square kilometres of granted and application tenure on the western edge of Lake Rebecca. Exploration activities are concentrated on exploration licence E28/1610 in the south east part of the project, with the balance being only lightly explored. Geology in the project area is dominated by gneiss interleaved with slivers of remnant greenstone terrain cut by granite and pegmatite dykes at all scales, and folded into a broad south-plunging anticline. In magnetic imagery slices of metamorphosed mafic and ultramafic rocks contribute strong magnetic responses and delineate the folding in the area. Previous explorers have interpreted granite, tonalite and granodiorite intrusions into the sequence, associated with magnetic low signatures. Regolith is variable, with a generally shallow sandy, calcareous or pisolithic red-soil transported profile over variably stripped oxidation profile. In general the Redskin and Duke areas have minor sub-cropping oxidised bedrock overlain by sandy and calcareous soils. At Bombora there may be up to 30m of cover on oxidised bedrock and surface geochemical sampling would be unlikely to be effective. The Company is awaiting grant of a 200 square kilometre tenement application (E80/4746) in the southern Kimberley region of WA. 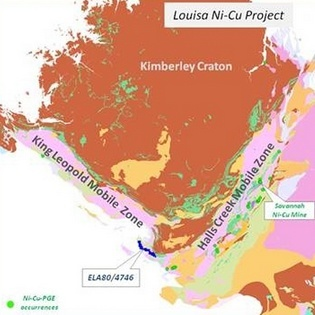 The Project is situated in the south-eastern part of the King Leopold Mobile Zone, close to a point of confluence with the Halls Creek Mobile Zone and has broad analogies to the Fraser Range geological setting. Nickel-copper mineralisation is present at several locations in the eastern Kimberley, including at the operating Savannah mine (Panoramic Resources Ltd). Regional scale GSWA geology maps show outcrops of peridotite and undifferentiated ultramafic bodies exposed in gneisses and metamorphic sediments, and as scattered outcrops in alluvial and colluvial plains. These exposures are coincident with a line of moderate to strong aeromagnetic anomalies, and there are additional anomalies under sand cover . Future exploration is likely to be led by airborne EM surveys over the ultramafic rocks. The commencement of exploration will be dependent on grant of the licence and execution of access and heritage agreements. The Yindi property covers a greenfield gold target on the regional structural corridor that hosts the >1Moz Carosue Dam group of gold deposits, at a point where splays and secondary faults intersect this corridor (Figure 8). 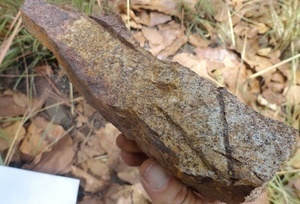 Previous explorers have defined soil and auger gold anomalies in four separate areas in outcropping parts of the tenement, and one of these prospects has progressed to RAB and RC gold drilling. 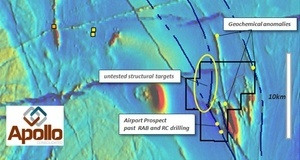 The key target here is a 6km long undrilled soil-covered structure. 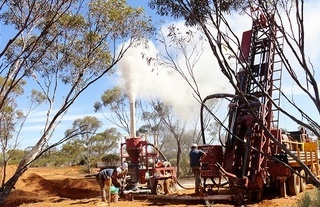 Competitor drilling along strike to the north and south has returned anomalous (>0.50g/t Au) gold results in the regolith profile, indicating that this is a potentially mineralised feature. Field investigation will be carried out to determine the best method for first-pass drill-testing.